Aero 500 or 662 motor-car in Czechoslovakia. Homepage. This page: A RHD Aero 500/662 car seen driving through a city in the 1950s. A rare Czech automobile built by Aero. 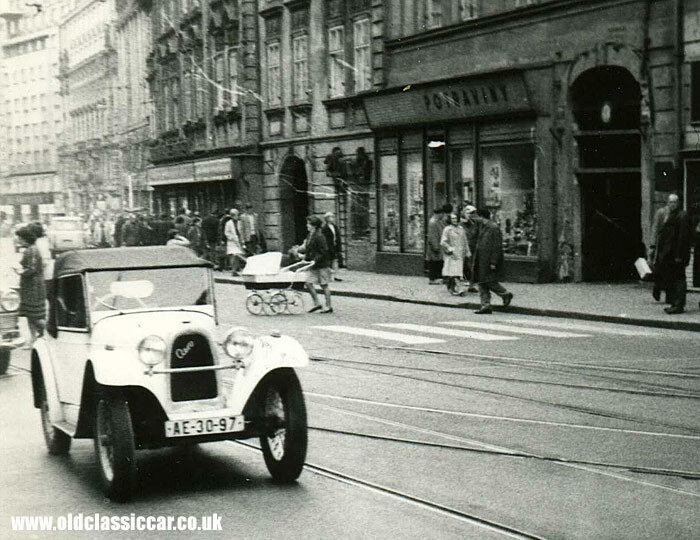 This old photo, which I had to crop down a little, shows an interesting Aero motorcar, driving along a street in Czechoslovakia, probably in the late 1950s (judging by the Opel just visible in the background). The registration is AE-30-97. Information on automobiles built by Aero is a little thin on the ground, with most online references being, understandably, written in Czech which makes research interesting. So far I've narrowed the model of Aero down to two possibilities, either the 494cc '500' (1929-1932) or the 662cc '662' (1931-1934), both of which look very similar. Photos of both types can be seen on this Czech site dedicated to the Aero. The 500 cyclecar had a water cooled single cylinder engine, with two seats up front and one perched in the tail, driving the rear axle through a three speed gearbox (no differential). The 662 had a vertical twin engine, and for the first time on an Aero, brakes on all four corners. Which model of Aero shown here is, I'm not sure, although I think the 662 is most likely. Comparing photographs I've seen of both models, the 662 seems to have had a taller radiator than the 500, similar to that shown on the car above. At first I was thrown by the car being RHD. A little reading around confirms that until 1939, motorists in Czechoslovakia drove on the left, hence the car being RHD. The scene is a bustling street, somewhere in a Czech town or city. Thanks to an online translation tool, I discovered that the shop in the background, to the right of the Aero with the sign 'Potraviny' above the window, literally translates as 'Food'.